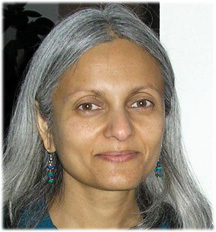 Uma Krishnaswami is a writing teacher and the author of SHOWER OF GOLD: GIRLS AND WOMEN IN THE STORIES OF INDIA, illustrated by Maniam Selven (Linnet, 1999); THE BROKEN TUSK: STORIES OF THE HINDU GOD GANESHA (Linnet, 1996), and STORIES OF THE FLOOD (featuring tales from around the world). Her upcoming books include: YOGA CLASS, an emergent reader from Lee and Low in 2001, and BEYOND THE FIELD TRIP, a “resource book for teachers on using parks, museums and nature trails as extensions of the classroom” from Linnet Books in 2001. This interview was conducted via email in 2000. Much of your work focuses on giving back to the writing community through teaching others. Can you tell us about your efforts in this regard? I teach a writing workshop for 3rd through 5th graders at Aztec Ruins National Monument. And I’m actively involved with my local arts council in helping get more of the arts in general and creative writing in particular into our schools. Did you write as a child? Yes, from quite early on. I often wrote sequels to books or stories I particularly liked. I recall getting into trouble when I was very young (maybe five or six) because I wrote an entire story, partly in words, partly in pictures – on the wall! Green crayon is very hard to paint over. It was all a lark at first. My first book was a collection of stories I began writing for my son, to read to him. I submitted it because my husband said he thought I should, so I was quite surprised when it got accepted as soon as it did, with only three rejections, one of them a personal one. So I had a relatively painless entrance into publication. Then, much to my astonishment, the process suddenly became tougher! The second story collection, THE BROKEN TUSK, earned a rich stash of rejections. That was good experience (in retrospect anyway), because I learned the fine art of reading and understanding rejection letters. But I am a great doubter of my own ability, so it’s always a nice surprise when a story or project actually does work out, when it gets good enough to be worth publishing. Who are your favorite writers — both from childhood and today? Childhood — A.A.Milne’s Pooh books, and an English writer called Enid Blyton. I grew up in India, so the world she wrote of was as far from mine as the ocean from Everest, and yet I loved her stuff, and read it avidly. I had a secret hideaway (well, perhaps not as secret as I thought). I would sit up in the branches of a banyan tree, with that huge tropical root system cascading down all around me. Perched up there with a pillow and a glass of limeade, I’d devour books like THIRD FORM AT MALLORY TOWERS and CASTLE OF ADVENTURE. And not question that huge gulf in the slightest. Today — I still love Pooh — the original Pooh that is, not the Disney caricature. In the adult lit world, I like Michael Ondaatje, Doris Lessing, Diane Ackerman, Anjana Appachana, Salman Rushdie, Amy Tan, Ha Jin — the list goes on. In the world of children’s books, Katherine Paterson and Jane Yolen are writers whose work I learn from and admire greatly. In the picture book universe there’s Rosemary Wells. I have too many favorites to list. Your first three books feature retellings of stories. How did you come to be interested in retelling traditional (or religious) stories? I grew up hearing stories, not necessarily in any formal way, but just in snippets and anecdotes, illustrating this or that point my parents or other adults would make. There are stories that to this day I feel as if I have always known, so I must have heard them very early in my life. So when I first began writing with a young audience in mind, it was very natural for me to begin there, with traditional tales. What are the special challenges in retelling a story? I think the biggest one is balancing two very disparate elements. The first is the story itself, and staying true to the story. The second is interpretation — helping an audience understand the story, especially if it is culturally unfamiliar and therefore raises questions along the way that need you to diverge and explain. Too much of that can kill a good story. Sometimes you have to decide not to use a story because the questions seem likely to overwhelm interest in the tale itself. Some stories aren’t meant to travel outside their cultural contexts. Others travel willingly and well. Why do you feel it is important to share such stories today? And what is the secret of their timeless appeal? The world is such a place of change today, and the fact that these stories have endured for generations, perhaps centuries, gives them a particular place of power. For me, retelling stories from India was of importance because at the time I began thinking of this there was very little out there, and I wanted kids of Indian origin, growing up away from the region, to have the chance to know and love these tales. As for appeal, I believe traditional tales appeal because they are at heart about emotions. While cultural context, beliefs, roles, all change with time and place, the fundamental emotions that drive us all are the same no matter who or where you are. What inspired you to retell stories of girls and women, of the Hindu God Ganesha, and of floods? The flood tales began without publication in mind at first, just finding and retelling stories for my son. But by the time I had researched and retold a few, I was hooked. I’d always loved writing, but hadn’t really done any for years before this. The Ganesha stories came about because I wanted to retell a collection of stories from Hindu mythology. I’d started writing a few stories, and struggling because they just weren’t hanging together as a collection. But Ganesha is sort of a gatekeeper in the tradition, the god of beginnings, and he really worked that way. As soon as I’d decided to focus on him as a character across many stories, the collection fell into place. SHOWER OF GOLD, about girls and women, is an idea that came, oddly enough, from a fifth grader in a class I was speaking to. I’d gotten a grant from AAUW to do workshops with kids in western Maryland, focusing on the diverse roles of girls and women in mythology, and one of the kids in the class asked, “Have you written a book about this?” And I said no, not yet, and kept on going. But I suppose her question stayed with me, and nagged me long enough that eventually I did. Stories from India and from the Hindu tradition are still rare in children’s books. What do you think are the challenges in further diversifying children’s literature? I think the biggest problem is one of perception — the impression in many circles, publishing and otherwise, that stories from a given culture are mainly, even only, of interest to those within that culture. You often hear the word “niche” in connection with such work, and it’s really a cop-out in some ways. It implies that kids will only read work that reflects their worlds, and I think kids are a whole lot smarter than that – they will read compelling stories, and they’ll read them over and over. But I think we have some wonderful, energetic voices emerging now in children’s literature, and they reflect our changing, diversifying world. Do you have any other related titles, perhaps by other authors, that you can recommend to interested readers? This is a hodge-podge list, so don’t look for any patterns in it. These are just books I like, and want to go back and dip into over and over. Can you tell us a bit about your upcoming books? I have an emergent reader, YOGA CLASS, coming out this fall, from Lee & Low. It is all of 28 words, many repeating themselves, with absolutely adorable illustrations by Stephanie Roth. I’m so pleased with this little project. It really helped my writing to work on something for very young readers, forced me to focus on the essentials. Then I have a book for teachers coming out in 2001, on teaching writing in special places – museums, parks, nature trails. That came partly out of the work I’ve done writing with kids at Aztec Ruins. Again, that was very different from my other published work, and it was a terrific learning experience. I should mention that I’ve also placed over a dozen magazine stories in the last year, and they have helped in two important ways. They’ve cleared my files of half-finished work that was good but not substantial enough for book-length publication. And they’ve allowed me to experiment with different forms, lengths, styles of writing, for different age groups. One little series has developed from this, the same characters growing across many stories. Look for those stories in Highlights and various magazines in the Cricket group. What gives you the greatest joy in your writing life? Finishing a story, putting it away for a week or two, and then coming back to it and knowing that it’s good. It doesn’t happen often (mostly I come back to it and see it as dreadful, inept, clumsy). But when I can be detached, not in love with my words any more, but still knowing the story can speak for itself, it’s the most wonderful feeling in the world.